1852 - Legislature grants charter for Camden & Atlantic Company to build railroad connecting Camden with Atlantic County. - Clara Barton, a Massachusetts native, establishes the state's first free public school in Bordentown, with six students in first year, enrollment surges to 600 in next year. 1854 - Camden and Atlantic Railroad opens to the public connecting Camden to new city of Atlantic City on Absecon Island, spurs sharp growth in population and rapid development of resort, first in the nation to focus on short-term visits by lower-income families. 1855- On March 12, Nassau Hall, the first building built in Princeton by the College of New Jersey (later Princeton University) is destroyed by fire. 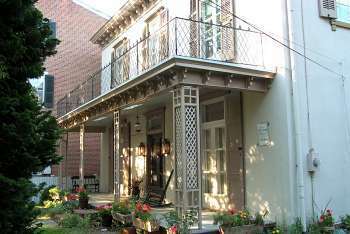 - President Franklin Pierce and Mrs. Pierce stay for ten days during July at the Congress Hall Hotel in Cape May, where the President delivers a patriotic address on the weekend of the Fourth of July. 1856 - US Congress appropriates $35,000 for construction of “Absecom Lighthouse” to reduce shipping losses off Atlantic County coast. - In September, the Mount Vernon Hotel in Cape May is consumed by fire while it was accommodating 2,100 guests, resulting in four deaths. Still unfinished at the time of the fire, it was the world's largest hotel and ultimately intended to have rooms for 3,500 guests. 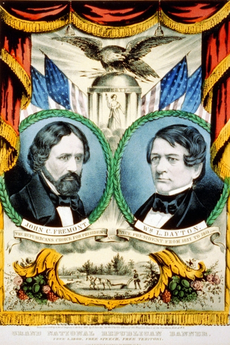 - In the November presidential election, Democrats James Buchanan and John Breckinridge are elected president and vice president, respectively, over the newly-formed Republican Party's ticket of John Fremont and William Dayton. Dayton, a former US Senator from New Jersey when he was a member of the Whig Party, is selected as the vice presidential nominee at the Philadelphia Convention over Abraham Lincoln. 1858 - Hadrosaurus foulkii, the first nearly complete dinosaur skeleton to be discovered virtually intact anywhere in the world, is unearthed in October in a marl pit in Haddonfield by William Parker Foulke, a member of the Academy of Natural Sciences of Philadelphia. 1861 - On his way from Illinois to his inauguration in Washington, Lincoln stops on February 21 in Jersey City and then Trenton, where he goes to the State House to give separate brief speeches to the state Senate and the Assembly. - After the outbreak of the Civil War with the firing on Fort Sumter, President Lincoln appoints William Dayton, then serving as the New Jersey Attorney General and the Republican vice presidential candidate in 1856, as Minister to France, a position he holds throughout the War. 1862 - The 13th New Jersey Volunteer Infantry leaves the state on August 31 to join forces deployed to defend Washington, DC, and subsequently sees its first combat at the Battle of Antietam in Maryland on September 16. The battle is the bloodiest single day in US military history, with an estimated 23,000 killed, wounded or missing on both sides. - Democrat Joel Parker, a major general of the state militia, is elected governor, running as a "War Democrat" who supported a military solution to the Civil War rather than accommodating the Confederacy. He defeats Republican Marcus L. Ward by the largest margin in state history up to that time. 1863 - On March 24, New Jersey legislature, with support of Governor Parker, passes a resolution expressing opposition to Lincoln's Emancipation Proclamation and use of war powers to suspend writs of habeas corpus and make arrests without warrants. - On July 1, the Battle of Gettysburg begins and continues through July 3. 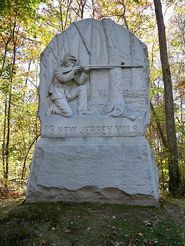 Of the total 93,700 Union soldiers, over 4,000 are from New Jersey, including second lieutenant Franklin Murphy of the 13th New Jersey Volunteer Infantry, who is elected governor in 1901. 1865 - President Lincoln is shot at Ford's Theatre in Washington by John Wilkes Booth and dies on the morning of April 15. After declining an invitation from the President to accompany him and Mrs. Lincoln to the theater, General Ulysses S. Grant and Mrs. Grant take a train from Washington to New Jersey to visit their children at a house in the City of Burlington which Grant had rented for his family to reside in during the last year of the War. After being informed of the assassination on his arrival in Philadelphia, Grant spends an hour with his children in Burlington and then departs by train on the next day to return to Washington. - On April 24, Lincoln's funeral train returning his body to Illinois passes through Trenton, Princeton, New Brunswick, Metuchen, Rahway, Elizabeth, and Newark. It arrives at 10 a.m. at the train station in Jersey City, where the coffin is removed from the railroad car and taken by ferry across the Hudson River to City Hall in Manhattan, where it is placed on a black velvet dais with some 500,000 people waiting in line. - Republican Marcus L. Ward, who was defeated in the 1862 gubernatorial election, is elected governor in November. After his inauguration in January 1866, he works with the new Republican-controlled legislature to secure state ratification of both the Thirteenth and the Fourteenth Amendments to the US Constitution, making New Jersey the last of the former Union states to approve the abolition of slavery and the guarantee of equal protection of the laws to former slaves. He also serves as chairman of the Republican National Committee from 1866 to 1868. 1867 - On February 1, the Camden & Amboy Railroad and the New Jersey Rail Road and Transportation Company join as the United New Jersey Railroad and Canal Companies, and in 1872 lease its assets to the Pennsylvania Railroad. 1868 - At the Democratic National Convention in New York City in July, the New Jersey delegation casts their votes for former Governor Joel Parker on all 22 ballots for the presidential nomination ultimately won by former New York Governor Horatio Seymour. Seymour loses the general election to Ulysses S. Grant. 1869 - The first intercollegiate football game is played in New Brunswick between Rutgers College and the College of New Jersey (later Princeton University), with Rutgers winning six to four. 1870 - World’s first boardwalk is constructed along Atlantic City beachfront to keep sand from being tracked into hotels and railroad cars, with the name recognizing railroad conductor Alexander Boardman, who with hotel owner Jacob Keim, conceived the idea of a boardwalk. 1872 - On May 18, the D&R Canal Company merges with several parallel railroads into the United New Jersey Railroad and Canal Company and leased for 99 years by the Pennsylvania Railroad. 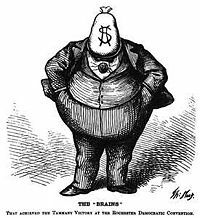 - Political cartoonist Thomas Nast, who drew original images of Republican elephant, Democratic donkey and Santa Claus, moves to Morristown from New York after threats on life resulting from his satirical cartoons depicting corruption of New York's Tammany Hall Democratic machine. 1873 - Sewing machine factory opened in Elizabeth by Isaac Singer. 1874 - Legislature passes law making school attendance compulsory throughout state. - The poet and journalist Walt Whitman purchases a home in Camden for $1,750 and moves from Washington DC to live in the home with his brother George. 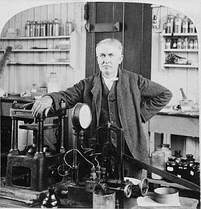 - Thomas Edison opens laboratories in Menlo Park (now Township of Edison) in Middlesex County. 1875 - Prudential Friendly Society is founded by insurance agent John Fairfield Dryden in a basement office in downtown Newark. It is the first company in the US to make life insurance available to the working class, providing funeral and burial expenses for low-income families, with some weekly premiums as low as three cents. 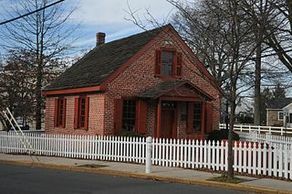 - The 1844 state Constitution is amended to conform with the Fourteenth and Fifteenth Amendments to the US Constitution, along with also providing that the legislature "shall provide for the maintenance and support of a thorough and efficient system of free public schools..."
﻿﻿1878﻿﻿ - A fire destroys much of the town of Cape May. When it is rebuilt, town leaders decide not to attempt to compete with fast-growing Atlantic City to its north, constructing smaller inns, shops and homes designed in Victorian styles. - Joseph Wharton, a Philadelphia financier whose estate in Philadelphia had been designated for condemnation for a new reservoir, acquires 150 square miles in the Pinelands, builds a mansion on his property and proposes exporting water from the Pinelands aquifer to Philadelphia. The New Jersey legislature passes a law to block his efforts, and in 1955 the state acquires 100,000 acres as the core of the Wharton State Forest. 1879 - Edison invents a practical incandescent lamp. 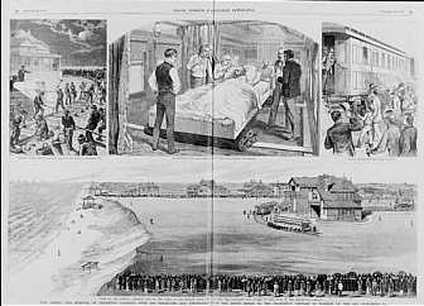 1881 - President James A. Garfield dies on September 19 in the Elberon section of Long Branch, where he had been taken to recover after he was shot on July 2 by a disappointed federal job-seeker, Charles Guiteau, in the Washington DC train station. Garfield dies in an oceanfront home which, to ease his trip, had a special rail line laid to it connecting to the downtown rail station in Long Branch..
1883 - Roselle becomes the first community in the world to be lighted by electricity when Thomas Edison demonstrates on January 19 that a single generating station could distribute power through overhead wires, lighting the railroad station, a store, about forty homes and 150 street lights..
1885 - Johnson & Johnson begins operations in New Brunswick. 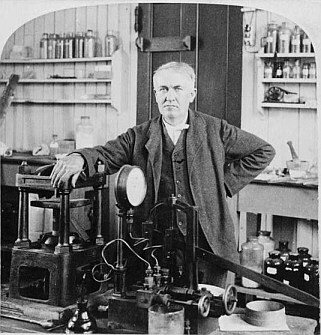 1887 - Thomas Edison moves his laboratories to West Orange in Essex County for more space for expansion and to be closer to corporate headquarters in New York City. 1892 - Ellis Island Immigration Station opens in New York Bay across from Jersey City, location contributes to surge in immigrant population in New Jersey. 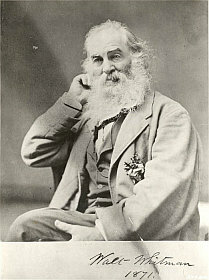 - Walt Whitman dies at his home in Camden on March 26, a few days before his 73rd birthday. He is buried in a stone mausoleum in the Harleigh Cemetery in Camden, which he had commissioned and built before his death. 1893 - Thomas Edison opens studio, the Black Maria, for filming of motion pictures in West Orange. 1895 - Reverend Irwin William Langston Roundtree is first African American to receive a Master of Arts degree from the College of New Jersey (as Princeton University was then known) on June 12, but University does not admit African Americans as undergraduates until World War II. 1896 - The College of New Jersey officially changes its name to Princeton University. In commemorating the occasion, Professor Woodrow Wilson gives a speech titled "Princeton in the Nation's Service," which becomes the school's unofficial motto. - The Iron Pier opens on the Atlantic City beachfront and two years later is purchased by H.J. 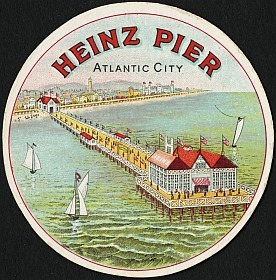 Heinz, who renames it as the Heinz Pier and uses it to allow visitors to taste Heinz pickles and other products, as well as handing out free Heinz pickle pins. - Millionaire George Jay Gould, the son of railroad magnate Jay Gould, builds mansion in Lakewood he names Georgian Court with extensive grounds that serves as a center for social and sporting events, including polo matches. The Lakewood estate is sold in 1924 to the Sisters of Mercy and becomes Georgian Court College (now Georgian Court University). Gould's Lakewood neighbors include John D. Rockefeller, who quietly acquires hundreds of acres, including the 300-acre Ocean County Hunt and Country Club with its golf course, and resides on the estate during the spring and fall until his death in 1937. In 1940, the Rockefeller property is purchased by Ocean County to be the core of Ocean County Park. 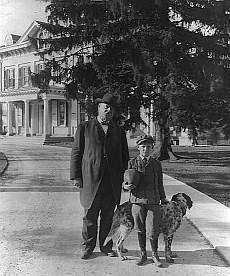 1897 - After completing his second term as president in 1896, Grover Cleveland purchases a home in Princeton which he names "Westland" in honor of his friend and Princeton Dean and Professor Andrew Fleming West, who assisted him in finding the home for purchase. Cleveland subsequently is named as a trustee of the University, and resides at Westland until his death in 1908. - Dr. John Dorrance, a chemist and nephew of Arthur Dorrance, the general manager of the Joseph A. Campbell Preserve Company, is hired by his uncle and invents the process to produce condensed soup, which sharply reduces shipping and storage costs and expands the market for soup products. 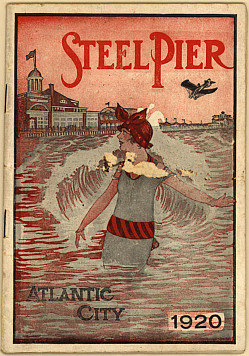 1898 - Steel Pier opens in Atlantic City on June 18, becomes most widely advertised amusement pier in world, known best for its diving horse attraction, but pier's theaters also hosted performances by Al Jolson, John Phillip Sousa and his Band, Benny Goodman, Frank Sinatra, The Supremes and many more.